See how Tesco Mobile increased their online sales by over 5%. Something to Phone Home About! Cart abandonment is a huge issue for online retailers, with the latest research finding that more than 75% of shoppers leave an order without completing the purchase. Tesco Mobile, one of the UK’s leading communication brands has also experienced this high volume of customers abandoning. Tesco Mobile approached SaleCycle with the goal of reducing cart abandonment, and improving their customer journey online. By implementing a personalised abandonment survey into their remarketing campaigns, Tesco Mobile gained valuable insights into the reasons behind customers abandoning purchases. 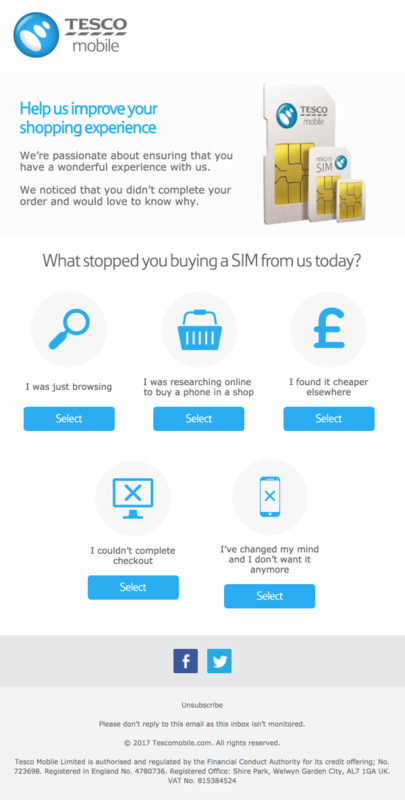 The survey emails are fully segmented based on the item left in the basket – such as Phone, Sim or Tablet, and are sent seven days after an abandonment to any customers who have not yet returned to complete the purchase. 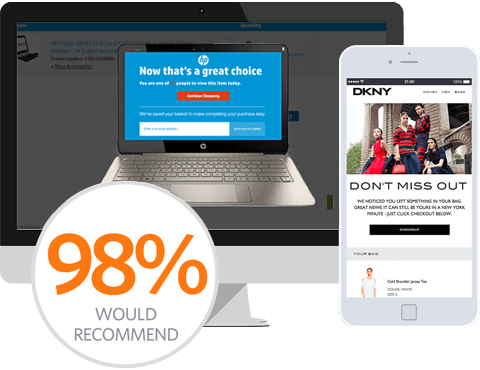 Customers are able to give their feedback with a single email click before being directed to a dynamic on-site display inviting them to expand on their answer. 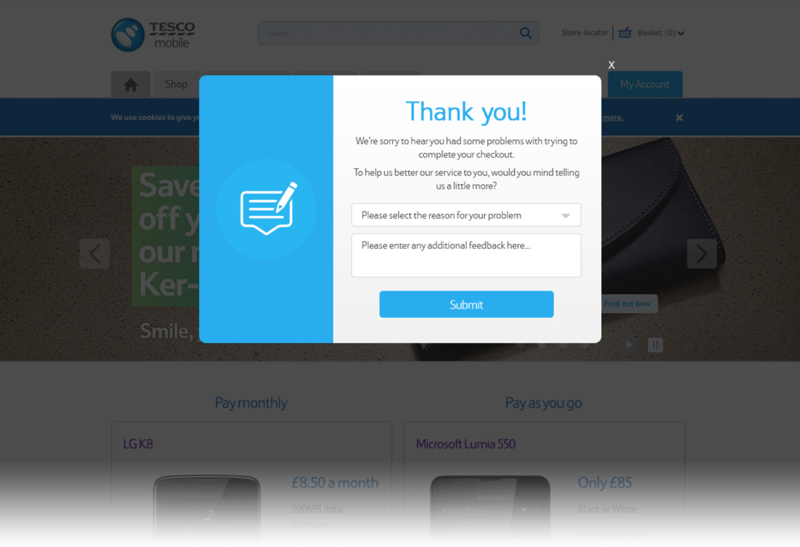 Thanks to its simple one-click response system, Tesco Mobile’s abandonment survey email has been incredibly effective with more than 20% of openers clicking through and giving their feedback. Most importantly, the insights have enabled Tesco Mobile to respond to problems within the checkout process and understand the barriers in their customer journey. 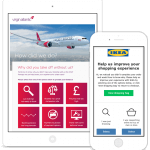 The survey email has proven to be important addition to an impressive cart recovery program, with the campaign delivering a 5% increase in Tesco Mobile’s online sales. That’s definitely something to phone home about. The challenge SaleCycle has helped us to solve is being able to win back customers that we would have previously been lost. With the constraints of our business – launching an abandoned basket program would be extremely time consuming and costly, so using SaleCycle is a quick and cost-effective way of delivering incremental value back into our business. Abandonment Survey - Step 1 Find out why people abandon. Abandonment Survey - Step 2	Get to the route of the problem. 75% of visitors add something to their shopping cart but leave your site. We’ll offer your visitors a handy route back to purchase when they’re leaving, and reconnect you with those who’ve already left.